While Magento default only permits to set minimum quantity for simple product, the extension provides an additional option named “Minimum quantity allowed in shopping cart” in the setting for every configurable product. This feature allows admin to set the quantity compulsory condition for a particular configurable product that customer must satisfy in order to check out successfully. This Magento extension also allow to set minimum quantity for configurable product on large scale. Admin can easily set the minimum quantity allowed in shopping cart for all configurable product in store. The quantity of a configurable is the total quantity of all of its children products in shopping cart. If this total quantity is less than the minimum value set by admin customer will see an error message reminding customer to add sufficient quantity for that configurable product. The “Proceed To Checkout” button will also be hidden, preventing customer from checkout. In case the total quantity of configurable product in shopping doesn’t satisfy minimum quantity condition, customer can choose to update shopping cart or continue shopping. There will be a success message notifying customer of successful adding of that configurable product to cart, and customer can proceed to checkout. Why Minimum Quantity of Configurable Product is your must-have extension? 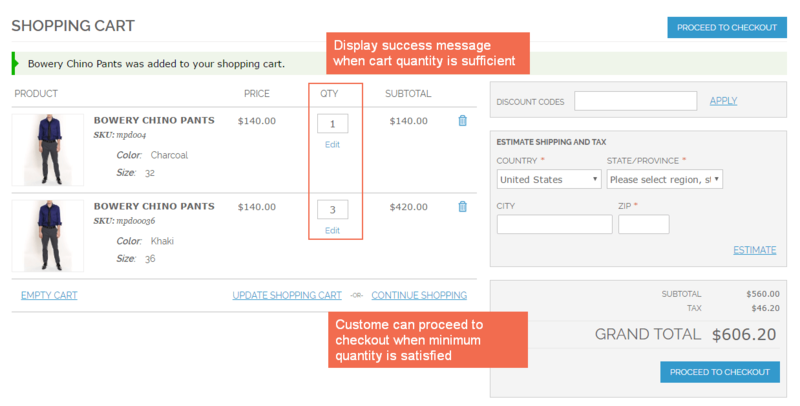 Magento default only allows admin to set minimum order quantity for simple product. This extension offers a straightforward and effective solution to set minimum quantity for configurable product. Admin can easily set min quantity for a particular configurable product or all configurable products with additional configuration options in the backend. As store owners may concern, there are many products which can’t be sold at small quantity because of additional costs such as high shopping cost, packaging fee or operation cost. Thus, setting minimum quantity is an effective solution to stimulate more purchase from customers, save up other costs and raise profits. If store owner wants to target some specific products for wholesale selling, it is essential to set minimum quantity allowed to purchase in shopping cart. When being acknowledged of the minimum value for checkout, wholesaler and retailer groups will be encouraged to buy till they meet the requirement quantity set by store owner. Magento Minimum Quantity of Configurable Product is very easy to use, also its configuration is very simple. The functionality is straightforward, this extension gets the job done as described above. The module offers simple and effective features to set min quantity for configurable product. It definitely helps our store a lot and boosts product sales. Such great module with reasonable price! Best extension, simple to use! I used to struggle to find a way to set min order quantity for configurable product. I followed tutorial and advice in blogs and forums but it was too tricky to try all of that. This extension gives me the simplest way to set min quantity for configurable product. Highly recommend!